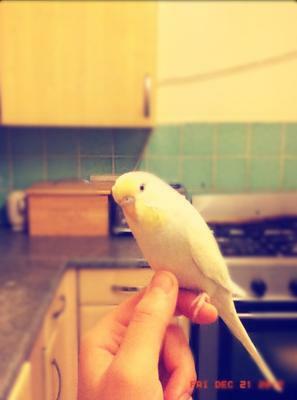 Tweety is the loveliest budgie ever!! He was so easy to tame, though when we first got him we thought he was a female, because the pet shop workers said he was! We've been calling him 'lily' for the past 3 months! He's an absolute sweetheart and loves everyone in the family to bits. He would snuggle on my chest for hours on end. I just LOVE the little guy and how fast he got tamed. Bless his little heart, he's moulting now so it's quite hard for him, but he's coming towards the end of the process so I am very glad the pain will be over for him. I feel so lucky he was very friendly from the first day I took him home, when he was just 3 months old! Bless the little guy he thinks I am his mommy! Well, I do spend nearly all my day with him so I don't blame him.